Today when someone has a motorbike, they want to make certain it’s stored safely. It’s not always possible to keep it in the house, and it may not fit into a garage. Leaving it outside unattended is probably a temptation thieves can’t resist. It’s best to make certain a motorbike is locked up in a secure location. 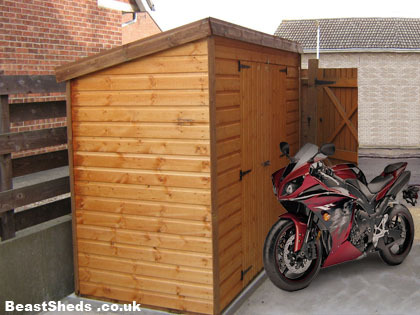 A shed from Beast Sheds could provide a cost effective secure solution for storing any motorbike. Our hasp and stable locks are found on the motorbike sheds. They are heavy duty and securely bolted as well as screwed to the shed. They are attached through the motorbike sheds cladding and framework. This means should anyone try to remove the screws, they would not be able to remove the hinges. Once the hasp is closed, the screws and bolts are hidden from view. 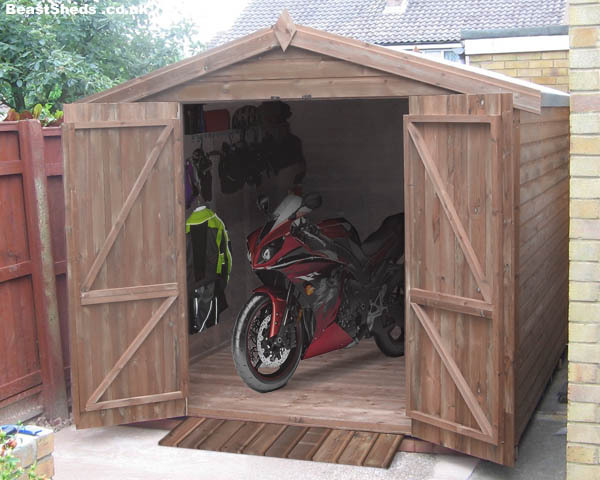 The floors used in our motorbike storage sheds have been subjected to rigorous testing. There have been full size cars as well as delivery trucks on the flooring which caused no damage. Our floors have never received a single complaint from a customer. Don't forget you can add sturdy shelves to keep your tools off the floor and to hand, and upgrade to even larger double doors if you have a wide bike. 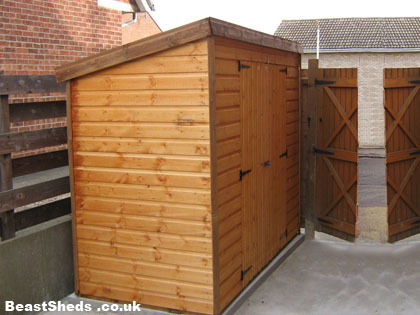 What makes a great shed to store your motorbike? All motorbike owners worry about the security of their beloved machines, as they are so tempting for thieves to steal! Windowless, strong, inconspicuous storage units such as the ones shown are perfect. Standard Window size (approx) 20" x 20"